Celebrate with the AAdvantage® program and earn more AAdvantage® miles in addition to those you normally earn on purchases you make this summer with your Citi® / AAdvantage® card or your CitiBusiness® / AAdvantage® card! 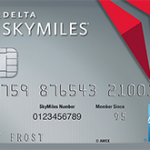 Be one of the first 25,000 cardmembers to register and be eligible to earn a bonus of 25% more miles on every $1 spent on purchases May-July 2006 up to a total of 2,500 miles3. A nice deal if you have the card. To register, go to http://www.aadvantage25.com.